Tonight, I exported my Session 80 blog and imported into this blog account, then deleted it. Earlier this week, I deleted my Wordpress blog and imported it here too. This is all in a move towards simplification. I think a big part of this move to consolidate my content is due to Google's recent streamlining of services thanks to Google+. The streamlining makes it easier to do things that previously required a bunch of other services. Google+ inspired the consolidation because of all the features it has, combining the best of what makes the other services useful. Previously, your blog pics were deposited into Picasa; but, if you wanted to add a photo, you had to upload or provide the link to the photo in your Picasa album. There was no way to access your albums. With the addition of Google+ and the new version of Blogger, it is now possible to add any photo or video hosted in your Picasa account. My photo posts previously had to be done through Flickr or Posterous. Videos used to require you to copy the embed code. Now posting videos from Youtube is much simpler from within Blogger. Remember Slide? Picasa does some of that. Posterous allowed me to post via mobile device. I can do that on Blogger through the Blogger app or by email. I could go on and on about what Blogger and Google products do now that used to require outside services; but, I won't. Simply note, my online presence is slowly converging into one account. I successfully moved ShaineMata.net from my old self-hosted Wordpress site to Blogger. I found Wordpress2Blogger earlier today, which converts from one format to the other. The Export/Import of the posts was easy. The only other work to be completed was to point the domain from my hosted site over to Google via the Godaddy. I am certain there are broken links and missing files somewhere. I don't think I'll go hunting for them; I'll probably fix them as I find them. Eventually, if I get rich, I'll hire somebody to check all my posts. I imported more than 1,000 posts; I'm sure you can understand my hesitation. I still recommend Wordpress for small businesses and other applications; but, for my own personal blog, it was too much. Additionally, there are features in Blogger that make it a better platform for my uses, that other people would not use. The features I like about Blogger, for my own purposes, are that updates are automatic, the ability to add location to posts, connection to Picasa web albums (and Google+ by extension), easy Android updating, unlimited bandwidth, free hosting, and really good SEO. There are also some who use it as a Tumblr site of sorts. In fact, that reminds me, Blogger has much nicer mobile templates than I have found for Wordpress. I'm not going to tell you that you should use Blogger for your site. It may be right for you, maybe not. It is for me. I realize that this breaks a lot of links to old content. I was going to have to do it eventually. At least now, if I die, I won't have to worry that my hosting account will be shut down for non-payment and all my content lost. I'll live so long as Google lives. I've been experimenting, for the past two weeks, with a regular old feature phone, a.k.a. dumb phone, for basic texting and calling needs, supplemented by a 7 inch Android tablet. The results have been good in terms of productivity. When I got my first smartphone, I was so happy to be able to access email and be able to tap out a text message on a keyboard. It was a Palm Treo by T-Mobile. With GPRS, the best I could do on the web was WAP. I tried a Sidekick and other types. I finally settled on a T-Mobile Dash, which was awesome with EDGE. I was really rolling along on 2G speeds. And phones got better and could do much more at faster speeds; and I got slower and more distracted from doing my work. Internet services started targeting the mobile user. We could tweet, post photos, write blog posts, hang out on Facebook, visit full websites, and so much more. Life was calm when there was hardly anything you could do with your smartphone except Tweet and email. If you're wired like me, it's hard to turn away from information. Being always connected can be problematic for the easily distracted. My tablet gives me the same ability to access and share information that I would have with a smartphone. The big difference is that I can leave the tablet in the car or leave it at home. Armed with just a simple phone that can only make phone calls and text, there is some degree of mental clarity you can achieve. I'm finding that doing the same on a computer is essential. When I need to get work done, I don't launch apps that alert me to incoming messages. Armed with just a text editor or productivity software, I can accomplish so much more. I think that is what is at the core of the feature phone and tablet experiment. One must have the ability to focus on essential functions, turning off or setting aside extraneous functions. There is no easy way to do this on a smartphone. It is far too easy to check email, tweets, and Facebook messages when all you needed was a phone number. I am even considering making my desktop my dedicated work space and shunting ALL messaging to the tablet. The reason I am thinking of this approach is that I remember years back, companies were attempting to create Internet appliances. All you could do with them was send email and browse web pages. This was to make it easier for people who really had no need for any software beyond those. In that way, I find that making my tablet into a social media, email, and Internet appliance, leaving the computer for real work, makes a lot of sense. I recognize that a computer can serve all those functions, including productivity software, easily without breaking a sweat. It's not about the computer, it's about me. I can't focus on work and have those things popping up or dinging in front of me. It is much easier to put my tablet on silent mode and then go to town with my work on the desktop. There is no need to launch an app or browser tab for my social media; it is already running on the tablet. Just knowing that the tablet has all that waiting is comforting to some degree, reducing the temptation for me to open a browser tab to check. Do you find that offloading communication to a more or less dedicated device helps you get more done? The President and Congress are in economic quicksand. Throughout his presidency, Obama has often blamed our economic woes on the past president, on a tsunami, on headwinds, on anything other than facing up to his greatest fear, he's in over his head. It seems like he can't get a break. At this point, the more Congress struggles, the deeper we sink. Whenever our leaders blame outside forces for causing our slump, it only highlights the lack of control they have over our situation. When you shift the blame, you also shift confidence in your abilities away from your person. True, the President and Congress did inherit some economic problems; but, they also created new ones. When they muscled through the health care reform bill, they spooked a lot of people. They spooked people who are concerned about national debt, eventually forming the Tea Party. Most importantly, they spooked the business community, who have some heavy economic burdens waiting for them in coming years as the full effects of health care reform and other legislation come due. The Dallas Fed president, Richard Fisher, makes good points about the underlying cause of the slow economy. The problem is not lack of credit or market liquidity. It's not lack of talented labor; in fact, after being unemployed for so long, much of our talent would accept a lower-paying job in their field. It's not lack of entrepreneurial spirit. The problem is that Congress has shifted too many laws too quickly during hard times. You do that sort of thing when there's money coming out of everybody's ears, when they are out-earning Washington, D.C.'s meddling. You don't do that sort of thing when business is tight. Business is naturally resilient. If you change one law, they'll adapt and fold the cost into their pricing. However, since the President took office and had a congressional majority in both houses, they ran rampant "fundamentally changing our country." Business will recover eventually; but many of the changes pushed businesses beyond their ability to recover quickly. The money management skills that make businesses successful in staying afloat is what is also preventing them from hiring people. If they go under, they aren't going to hire anybody ever again. It is in a business's and employee's best interest that they stay in business, even if it means parking their capital until better times. Many of the laws, spending cuts, and other manipulations were back loaded past the next election. Many of the big costs to business will come due after 2012. Extra employees are future heavy burdens in their minds. It's hard to plan with uncertainties. Ironically, all the thrashing about that Congress is doing only leads the business community to worry more about their, our, future. Congress is feeding the fear. All the ingredients for an economic recovery are there. But, our Government is not instilling confidence in our abilities or chances of successfully doing it. So, every time they pass the buck on why we aren't doing well economically, it reveals to us that they are in quicksand and rapidly sinking over their heads, dragging us along. If they would just stop and allow business some breathing room from new regulations and costs, it would give business time to figure out what to do next. The real problem is Congress making "Comprehensive" legislation. They don't just tweak laws here and there; they change everything. Business can't hope to keep up if the rules change every month and require boatloads of lawyers to decipher, so they clam up and hold on to cash to pay for hidden costs and said lawyers. Keynesian economics might work if we all participate moving money along in the economy; but, when you freak people out, we save rather than spend. What we need is confidence in a better future. Unfortunately, our present leadership does not inspire that. What could we specifically do? Moratoriums on all major legislation coming due in the next 5 years. Just, hold off until better times. No more new laws that cost state governments (yes, states are hurting too) or businesses more money. Real spending cuts rather than cuts in projected budget growth. Hold off on new taxes (unless it's banks, tax them good). I don't like banks. I'm not saying do this forever; just until our economy floats enough that we can pull ourselves out of the quicksand. But, I understand how difficult it is to keep the sinking victim calm; the last thing they want to do is stop thrashing around. Good luck to all of us. Remember, don't panic. My experiment with using a feature phone with an Android tablet seems to be paying off in terms of mobile productivity. The theory of the experiment is that I will have greater focus by not having a smartphone. All information needs are being served by the tablet or desktop. 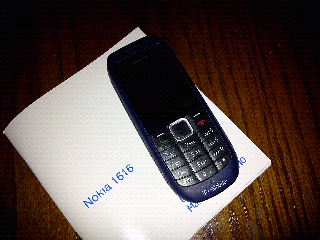 My new handset is a Nokia 1616. I was previously working with a Sony-Ericsson Equinox handset in the experiment. It's not a bad phone; it is absolutely more basic than your average smartphone. However, like many modern phones, the battery life is not all that it could be. My Android phone, loaded with apps, can go about half a day without recharging. Leaving it stock without apps and very light web browsing gets me a full day. The Equinox can pull three or four days of service on one charge. I think its talk time is rated around 7 hours. That is three days of not worrying about a charger. Unfortunately, the Equinox has a camera, bluetooth, and a WAP browser. It's too tempting to fiddle with the phone. I think it's just habit to whip out the phone and check things on it, having owned an Android handset for some time. So, why switch to the cheaper and less featured Nokia 1616? The little Nokia has a meager 800 mAh battery; but, it can squeeze out 13 hours talk time or 1 month standby from one charge. It can achieve this because it pretty much only makes phone calls. It has no camera. It has no browser. It doesn't have an MP3 player. That is not to say the Nokia 1616 is devoid of any fun. It has an FM radio receiver and a flashlight (torch for you non-Americans). It's probably a guy thing; flashlights are cool. Other than that, it makes phone calls. Technically, it has some apps and games; but, I assure you they were cool back in the day, not now. So, what are my results so far? No more texting while driving. All sms is redirected to my tablet. No more checking news while driving. Same reason. It's too easy on a smartphone; too clumsy with a tablet. More attention at meetings. You simply can not sneak peaks at a tablet. It's very obvious. Fewer check-ins. If you have to change devices, it's too much work. Overall, having a simple phone forces you to be more deliberate with your Internet and social media. That is not to say you can't do anything with your feature phone. You can still use voice services. For audio recordings, there is cinch.fm for the die hard podcaster. For keeping track of tasks and general productivity, there is Reqall. Let's not forget, you can call people and either talk to them or, more commonly these days, leave a voice mail. Three separate TED talks on the challenges boys and men face in modern culture. Reading Steve Garfield's "Get Seen"
I am currently experimenting with a feature phone, a Sony-Ericsson Equinox, and a Samsung Galaxy Tab (7 inch). Previously, I had a T-Mobile MyTouch 3G handset, which also runs Android. I have wanted to do the experiment for some time; however, due to ill timing on my phone contracts, I'm stuck paying for duplicate Internet service on my handset and on the tablet. It seems like it would be a waste to not use both Android devices. Putting all that aside, I have thought that I could conduct my business and be more productive, overall, if my handset were not a smartphone. The idea is to use one device just for calls, and the other for all the other wonderful things it does. Today was my first day of the trial. One improvement is that the lack of features makes it less attractive to me to play with the phone while driving. At most, I'll call Reqall. The tablet is not an option because you can not easily hold it in one hand and type at the same time. Presumably, you need the other hand to steer. Another benefit is that it is much easier to not check messages on a tab than it is on a handset. I can't explain the reasoning behind that; it just is. Battery drain is less of a problem on feature phones compared to smartphones. This means you really do get more talk time and have to recharge less frequently. I expect that my work flow will change as a result of having a dedicated phone that only does phone calls. My current handset is a spare one we had around the house. What I'd really like is a much cheaper phone with fewer features. There is a little Nokia that can squeeze out 13 hours talk time from one charge, versus 4 hours with the Sony-Ericsson. I don't really talk all that much; but it would spare me the car charger juggling between devices. I recognize that this experiment goes against the whole notion of using your phone for everything. I was big into that for a while until it became inconvenient to talk on the phone and use other features simultaneously. As mobiles have enabled us to break free of the desk, they also require you to use them for other things, which is tough to do while you're on a call. Having a dedicated phone seems the way to get the most out of your mobile smart device. At least it does for me.